InstaForex offers its clients a new software product Superior Forex Desk. It is an order management tool that extends trading functionality of the MetaTrader 4 trading platform. Thanks to Superior Forex Desk, order setting became much more convenient and now it takes less time contributing to faster and more effective trading. The program’s interface was created as a compact trading panel that allows traders to set a deal size, trailing and stop losses as well as take profit orders. Using Superior Forex Desk traders will have expanded possibilities of trading. Every trader can use the Superior Forex Desk service for free. lock the total position on a particular instrument or lock particular deals. 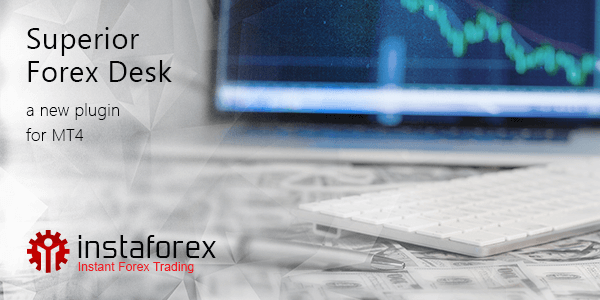 Superior Forex Desk will make your workflow with open orders more intuitive and convenient. After you install the plugin to your PC, you can use it together with other technical tools available in MT4.